Mar. 13 – As Internet use in Asia continues to develop thanks to Asia’s seemingly infinitely growing Internet penetration rates and a consistently growing number of web users, methods to go online have evolved from the usual desktop experience into something much more, literally, mobile. Because of Asia’s broadband infrastructure, accessing the Internet has proven to be somewhat of a chore for people located in more remote or underdeveloped Asian cities and countries. However, thanks to the advent of mobile smartphones and their corresponding popularity and high usage throughout Asia, mobile Internet has emerged as increasingly accessible throughout the region. 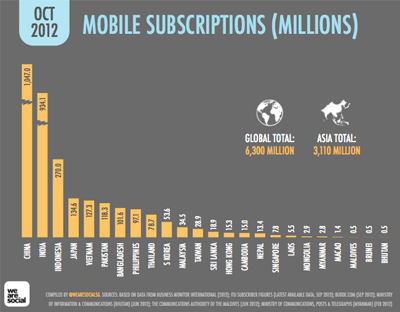 There are currently 3,110, 235,171 total mobile phone subscriptions in Asia. China and India account for most of them – the two countries alone added a total of 60,000,000 new mobile phone subscriptions between June and September in 2012 (note: ‘mobile subscriptions’ refer to the number of SIM cards being used in each country, not the total number of people that use a mobile device). As of now, there are actually a greater number of combined mobile subscriptions in China and India than there are people in the United States (U.S.). India and China combine for a net gain of about 10 million new mobile subscribers per month, and account for about 32 percent and 28 percent, respectively, of Asia’s overall market share. By the end of 2012, there were a total of 794,000,000 mobile Internet users in Asia, and about 18 percent of all web traffic in Asia came from a mobile device. About a quarter of phones used throughout Asia are mobile smartphones that are capable of accessing the web through mobile Internet browsers (there are roughly 844,000,000 smartphones in Asia). The current trends show that there is an increasing number of mobile Internet users in developing nations such as Vietnam and Indonesia due to the limited ability to access the Internet through other media, such as desktop computers. Increasingly, mobile platforms are the best way to access the Internet in these regions. As a result, mobile devices have been used for services ranging from online banking, money transfers and email, to accessing news on commodity prices, commerce and government procedures and regulations. Due to the lower percentage of internet penetration through desktops in these lesser developed regions, mobile internet usage has come to overtake traditional desktop internet usage more so than in more developed countries such as the U.S. The rate of adoption of mobile broadband increased rapidly across Asia as networks were progressively upgraded to next generation platforms, in addition to the relative ease of using a mobile device to access the web. A greater number of people own a mobile phone compared to a desktop computer in South East Asia, which has given way to the potential and actual delivery of mobile data services in the region. By the beginning of 2013, there was a total estimated 3 billion mobile subscribers in Asia, increasing at a rate of about 15 percent annually. Overall regional penetration also reached an estimated 72 percent, with many countries in Asia even having mobile penetration levels in excess of 100 percent. Like the Internet itself, this trend spread beyond the borders of South East Asia and into Mainland China. The China Internet Network Information Center (CNNIC) recently released a report showing that mobile internet use is overtaking desktop internet use throughout China. 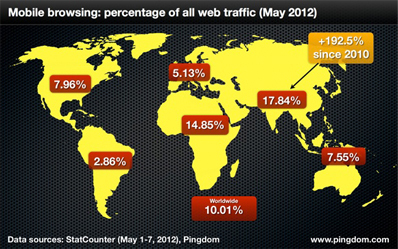 The CNNIC report found that 72.2 percent of internet users use mobile devices to browse the web. In the meantime, as a whole, desktop internet use has dropped by 2.7 percent. CNNIC came to the conclusion that the spike in mobile internet users occurred due to the need for people living outside of China’s big cities to depend on their mobile phones to access the internet. Mobile phones accounted for a whopping 60.4 percent of China’s rural internet usage, a trend that can prove that mobile internet use is poised to continue to spread like wildfire throughout rural Asian regions. 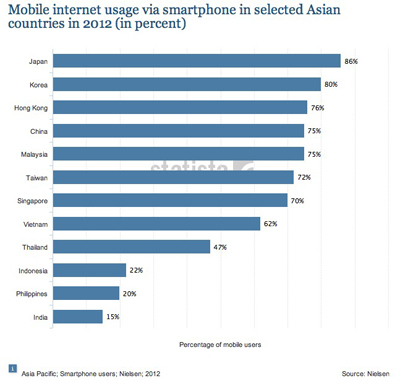 With 1.4 billion mobile Internet users projected to be in Asia by 2015 (about 1 billion throughout China, India and Japan, and about 150 million scattered throughout Indonesia, the Philippines and South Korea) the rising trend of mobile internet use seems likely to stay and expand. Mobile internet use has given everybody the ability to connect to the world wide web, further connecting the old and the new as the world becomes increasingly more digital. The best way to adapt to the future is to not be slowed down by the desktop, but to instead adapt through mobility.